Mode Junkie: take me to the candyshop! receiving the craziest shoes ever? as the postman rang my bell today, i giddily ran to the door and ripped the box in front of him. i kinda left him speechless but what´s a girl to do? if you like them, i suggest you sign up for the waiting list fast. i heard they´re getting some more. as i was opening the package, i could smell the hours of work he´s put on to these shoes and not to mention patience. i am so proud to own one of his creations. i can see that the man is going places with his dope footwear! and i knew exactly how i´d wear them. wow ich liebe dieses Outfit, vorallem die Schuhe sind ja mal der Oberhammer! I'm so in love with your outfit! Love the way you combined all these colors. It screams SPRING! This pink dress is so lovely. And OMG "diese Schuhe"!! :D AWSOME!!! Really wonderful! Aaaw AND I MUST say that these eccentric fineries (faultlessly) remind me a certain "Fetish candy" idea Dear !!! "Scintillating creativity" . . .
Those shoes are crazy cool! And trust me, my UPS delivery guy thinks I'm absolutely nuts! He's actually come up with a secret hiding place for my packages when he knows I'm not home hehehe...anyways, really cool shoes and love how you styled them! wow.im without voice.i wanna buy them. I'm literally dying in the sight of these babies!!! Candyshop for sure! You look de-li-cious!!! omg, was für abgefahrene schuhe! Yummie, my eyes are falling down! Oh...how lovely are those booties..they look delish!! omg!!! 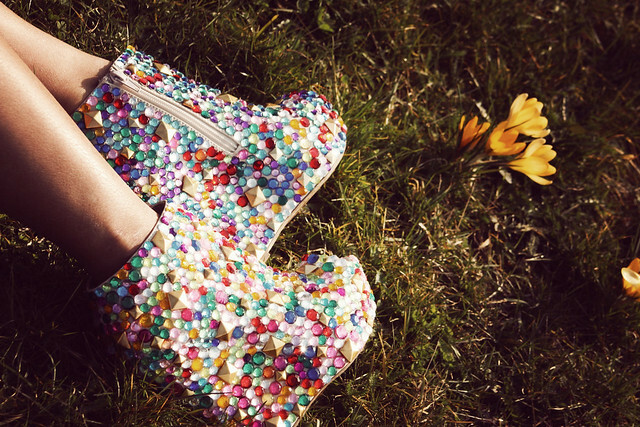 so so so amazing shoes, i wanna those shoes too !!! I cant breathe! your shoes are perfect! ah you look awesome Honey!!!!! Love the colours! Pink + purple is always good in my book! those shoes are INSANE. Love them! SUPER dope shoes! Perfect addition to the shoe collection! U look gorg btw! wowee - your shoes! and great outfit, love the colors. i was thinking of buying that pink dress from zara, i think i need to buy it now! I was a bit skeptical about these shoes.. but OHMYGOSH!! They are freakin' amazing. I Love them so much. I NEED to get on that waiting list. You've styled them to perfection as usual. OMG OMG OMG this biker jacket is to die for ! I'm going to H&M tomorrow !!! Actually, i love everything ! I want to eat your booties!! Wie kann jemand so super aussehen??!! I have no words to describe how awesome I think these are! My hands are itching for a DIY! God, I'm in love with that dress! And of course the shoes, awesome! Love the color blocking, these shoes are amazing. So cute - love what you wore the booties with. They look fantastic for spring! I also love the bejeweled pumps by the line. beautiful shoes i must say! just like candy. oh great wedgesn you styled it very good! and i love your jacket tooo! yeah, they are kinda hot! loove them! enjoy them! hey beauty!!! how r u!!? amazing post !! I really love this look, amazing colors ! Awesome boots! I have to order one pair as well. beautiful outfit! i love your dress! and especially your booties, they look like yummy candy! ahaha! wwooow die Schuhe sind einfach der Wahnsinn!! really To die for!! These shoes are just off the chain I mean I made several things by hand back in the days when I was a DIY-junkie but you need a lot of patience and know about that! wndhfgkuhjdvcbjshgfiYGVJCDH!!!! NAKAKALOKA! ang ganda lang ng shoes. Those are some killer wedges. Love your bright color combinations! NAKAKAINIS ka talaga ang bongga bongga ng shoes. joskoday! i saw something like that sa online store din. kaya lang chaka version. OA sa bato. Was thinking of gettin it, pero out of stock na. guuurl. i love te colors. so nice na maaraw but you can still wear jacket. ang init na kaya dito. gas! Wooow. You look amazing. And the shoes...common, they are the best I saw in ages. Congrats for the outfit! You're cheekbones are amazing! And the shoes too of course :) I'm new to your blog, I love it! Wauw! Yess, you're really the best in colorblocking my dear! So perfect! And these shoes are just a piece of art! Loving the colors! The purple arty ring is gorgeous and I need that jacket. The shoes? there's no word for them! omg diese schuhe sind der wahnsinn! you're sooo beautiful I have no word to express that ;)) the shoes are stunning, I love them, and the rest of the outfit is divine, gorgeous !! omg omg omg those boots. Gosh girl u r so amazing.. *___* greetz from Poland..
and hey your shoes oh my good your shoes are amazing!!! and now i FOLLOW YOU!!!! HOLY EFFING GOD, those shoes are a kaleidoscope! Beautiful. okay. now turning green with ENVY! love, love, loooove your booties! brilliant! i just feel spring in the air! OMG ARE YOU KIDDING ME ?? Those booties are amazing !!! Woweeeeeeee!! It's like you rolled around in a sweetie (candy!) shop and they all stuck to you. Brilliant. Ooohhh this is colour done to perfection! Just looking at this outfit brings the biggest smile to my face....I'm all about bright colours right now and I think the more the merrier! Your outfit is just that and I can't stop staring at all the pretty colours in it! Wow... your history! That's all my fear: leave my funny Brazil, where I'm a lawyer, to live in Italy and start my life again with my italian fiance! I get respect for you like a person and for your style (OMG... those shoes)! BRAVO! oh my gully... youre shoes is to die for!!!!! its so adorable!!!! Definitely one of your best outfits!!!!!!!! Love the whole outfit and the shoes are INSANE!!!! These shoes are really greattttttt ! I have seen so many colourblocking outfits so far, but this one is the best! OMG!, I'm in love with the boots. I'm gonna DIY it. i can't stop staring at your shoes! where do you find all these fabulous shoes darling?!?!?! Wahnsinn! Das ganze Outfit ist echt super - die Farben! 1A! Und die Schuhe sind zweifellos ein Hingucker und verleihen dem Ganzen nochmal etwas ganz Besonderes. amazing. amazing. amazing! It rarely happens that I become so obsessed with an item I see on a blog that I MUST have it! Of course, it's sold out on solestruck. Lucky girl! You look so fab in them!! They look so yummy love those shoes. You really have great shoes. Your shoes are brilliant. Where did you have? You love fashion! We love it too!